The company that develops this is Brave New Code and they have announced some updates coming in the future to the plugin for WordPress. Themes – This means that not all blogs with this plugin will look the same. We can customize the look how we want it. For iPhone/iPod touch visitors this means they can bookmark your website to their home-screen and your website will automatically be saved as a self-contained application which will run in fullscreen mode. This means no address bar at the top of the screen, nor navigation bar at the bottom. Just your mobile site, in full and glorious view. All posts, pages, comments, etc., are handled with Ajax, and assets and resources for your mobile site will be saved and stored locally on a visitors device using HTML5 cache technology, whether in web-app mode or not. This means a super-fast and highly-optimized, custom website experience for your website visitors, as native as one can get to a native application on the iPhone/iPod touch. Don’t expect this too soon. The Beta hasn’t even been released yet. We’ll let you know when we change things. 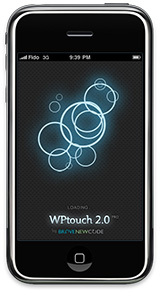 Thanks for spreading the word about WPtouch 2.0. We’re hoping to have a private beta going in about a week or so. If anyone wants to be notified when its released, they can check out wptouch.com or check our main website from time to time. We’re anxious to unleash this into the wild soon. New iPad Commercial: What is iPad?